When you think of muffins, "healthy" probably isn't a word that comes to mind. 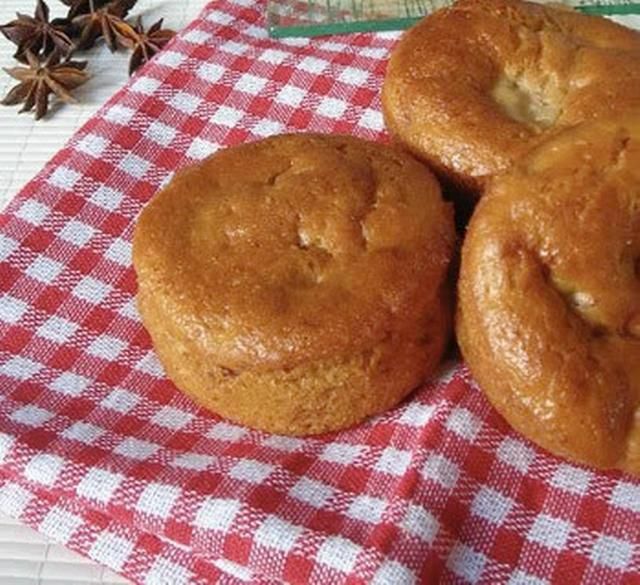 But you can have your apple banana muffins and eat them too! This fat-free vegan muffin recipe gets plenty of moisture—and healthy fiber—from apple juice and fruit, so there's no need for margarine or oil which add fat as well as calories. While some vegan muffins fall flat and are more dense and bland than delicious, these muffins don't skimp on flavor or make you miss dairy and eggs. If you're looking for apple banana muffins that are both healthy and vegan, this is a good one to try. Even non-vegans can agree that there's no shortage of flavors in these muffins. While you're waiting for the muffins to bake, pour yourself a nice tall glass of non-dairy milk to enjoy with a light breakfast or snack. Then dig in! Preheat the oven to 325 F and lightly grease a muffin pan. Add the apple juice, apple, and mashed banana and mix well. Pour the batter into the muffin pan, filling each cup about 2/3 full. Bake for 35 to 45 minutes, or until muffins rise and are golden brown. Oven temperatures can vary. Check in on the muffins periodically with a toothpick to ensure you are not undercooking or overcooking them. Sifting the flour before adding it to the bowl will help you attain fluffy muffins, instead of hard and chewy ones. Looking for more options to break out of a breakfast rut? Try these other vegan breakfast recipes that will keep you satisfied today or any other morning of the week.